The AGM-130 is a rocket-powered extended-range derivative of the GBU-15(V)/B electro-optically guided glide bomb. A development contract for the AGM-130 missile was awarded by the USAF to Rockwell (now Boeing) in 1984, and called for a glide-bomb equipped with a strap-on solid-propellant rocket motor. The first flight tests occurred in late 1985, but operational tests were not completed before 1989. Initial orders were placed in 1990, but in 1991 the development of some significant upgrades began. These included a new CCD seeker and a GPS/INS (GPS-aided Inertial Navigation System) mid-course guidance. According to official sources, Initial Operational Capability of the AGM-130 with the Air Force was achieved in 1994. This date probably refers to the IOC of the missiles equipped with GPS/INS and CCD seeker. The AGM-130 is basically a GBU-15(V)/B glide bomb with a Rocketdyne (now Alliant Techsystems) SR122-RD-1 solid-fueled rocket in a strap-on WPU-9/B propulsion section. The basic modes of operation (lock on before or after launch, two-way data link) and terminal guidance options (TV, IIR) are identical to those of the GBU-15(V)/B, q.v. for further details. After it has been dropped from the launching aircraft, the AGM-130 enters a glide flight (presumably down to the preselected cruise altitude) and then fires the rocket motor. The missile follows a low-altitude flight path, using a terrain-following system with a radar altimeter. The propulsion section is jettisoned after motor burn-out, and the missile has a range of more than 65 km (40 miles) for high-altitude and about 24 km (15 miles) for low-altitude drops. It can either fly autonomously to the target area using its GPS-aided INS, or receive updates via the data link. For terminal guidance, all versions of the AGM-130 can currently be fitted before the mission with either a WGU-40/B TV/CCD or a WGU-42/B FPA (Focal Plane Array) IIR seeker (original seekers were DSU-27B/B TV and WGU-33A/B IR). The seeker can be locked on the target before launch, during the flight, or not at all. In the latter case, the missile is either flown "manually" to the target via the data link, or will continue to the originally targeted GPS coordinates. All AGM-130 variants use the "short chord"-type wings and fins of the GBU-15(V)/B, but use different types of warheads. 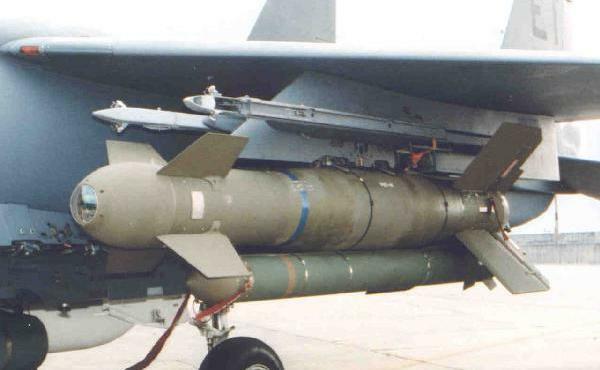 The AGM-130A uses the 906 kg (2000 lb) MK 84 blast-fragmentation bomb, while the AGM-130B was a proposed airfield-attack version with a submunition warhead. The AGM-130B was to use a SUU-54/B dispenser with 15 BLU-106/B BKEP (Boosted Kinetic Energy Penetrator) runway-cratering and 75 Hunting HB876 area-denial submunitions, but this version was not procured. The seeker options are designated by suffix numbers, and the latest versions of the -130A are the AGM-130A-11 (TV/CCD) and AGM-130A-12 (IIR). The AGM-130C is similar to the AGM-130A, but uses a 906 kg (2000 lb) BLU-109/B penetrator warhead instead. The latest subvariants are the AGM-130C-11 with TV/CCD and AGM-130C-12 with IIR terminal homing. The AGM-130D is a variant with a BLU-118/B thermobaric warhead. Training variants of the AGM-130 family include the CATM-130A captive-carry missile and DATM-130A ground-handling training dummy. The first official combat use of the AGM-130 occurred during 1999 against Iraqi air-defense installations, and the missile was also used in 2001 during Operation Enduring Freedom in Afghanistan. Boeing also proposed and tested several extensively revised variants under the unofficial designation AGM-130E. These included a turbojet-powered extended-range version with a dual mode (TV/IIR) seeker as an entry into the British CASOM (Conventionally Armed Standoff Missile) competition, and several turbojet-powered variants with lighter warhead and/or extended capabilities. However, none of these variants was put in production. Between 700 and 1000 AGM-130 missiles have been procured by the U.S. Air Force, and the only current carrier aircraft for missile is the F-15E Eagle. The AGM-130 is produced by retrofit of existing GBU-15(V)/B bombs.